Here’s a timeless game that can be relaxing to your eyes. 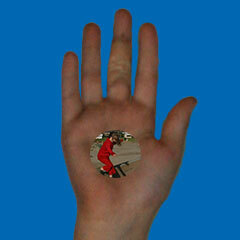 Create an optical illusion that makes it seem as though you have a small round window through your hand. A tube large enough for you to stick two fingers inside (use a rolled sheet of paper or a cardboard tube). With your right hand, hold the tube up to your right eye and look through it. Hold your left hand about six inches in front of your face, your palm facing toward you, and the base of your little finger against the side of the paper tube. With both eyes open, you should see something strange. You’ll see your hand in front of your face, with a hole going through it. If you don’t, try moving your hand a little farther away until the hole comes into focus. Usually your eyes see the same image from two slightly different angles. Your brain combines these two views to let you see the world in three dimensions and judge how far away things are. Because of the tube, your brain receives two different images, one from each eye. While one eye focuses on the near image—the palm of your left hand—the other eye focuses into the room through the tube. When your brain is asked to take in two very different images, it has to “choose” which one to see. Since the sides of the tube block out much of your right eye’s view, you’ll mostly see the view from your left eye. Yet your brain will include in its attention the circular image that your right eye is seeing through the tube. As your brain merges the two images into one, your hand will appear to have a hole in it. Don’t See the Hole in Your Hand? Do the Brain Buttons and Lazy 8s activities, then play the game again. This game has been used in the Visioncircles course since 1987.